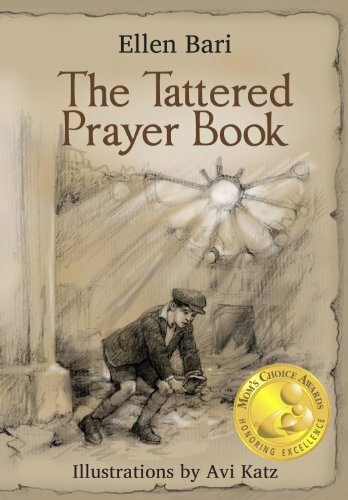 Sometimes it’s hard to know how to introduce young children to the harsh realities of the world, but author Ellen Bari has made this dilemma easier by penning a touching, age-appropriate holocaust story called The Tattered Prayer Book. In the book, young Ruthie visits her grandmother’s home and stumbles across a box full of mementos marked “Germany.” Inside she finds a burnt and tattered book with words written in Hebrew and German and is told it is her father’s prayer book from long ago. Since Ruthie’s father has never once mentioned living in Germany and doesn’t even have an accent, Ruthie is shocked that the prayer book belongs to him. Thus begins her quest to know who her father is and what the prayer book means to him. She learns that he lived a happy life in Hamburg surrounded by a large doting family and many Jewish and non-Jewish friends. Then the Nazis took over, and suddenly the Jews became outcasts. The friends they had grown up with and played with everyday suddenly ridiculed them and even threatened them with violence. As the violence escalated, the Nazis set fire to the Jewish synagogues, and Ruthie’s father found a burned and tattered prayer book among the ashes. He hid it in his coat, and when he and his family were forced to flee to America for their safety, he brought the prayer book with him. This quiet book touches upon very important topics that are just as relevant today as they were at the time of the holocaust—namely, bullying, battering and discrimination. The text is simple and age-appropriate though the subject matter is likely to conjure somber emotions for young readers. Also, the book’s overall layout sometimes makes it difficult to follow conversations or recognize who is speaking. These drawbacks aside, this book should do well in an elementary social studies or citizenship class or as a jumping off point for discussions on bullying, acceptance, and individualism.